After leaving Mt Fuji we had lunch at a nearby hotel. We shared a table with an elderly gentleman who was born in Japan but had lived in the US since the 1940s, his daughter, a couple from Germany, a couple of Switzerland and a girl from Thailand who is studying in Perth. It was quite an international table! Lunch itself was very nice but the hotel staff rushed through it a bit. Oh well...I was still very full by the time we left. Our tour guide decided we were running ahead of schedule so we stopped at a Buddhist temple for a short visit. 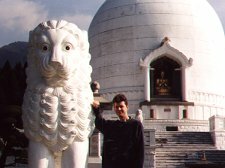 It was quite an unusual temple having been built with an Indian design. To get to the temple, you have to walk up a steep hill. 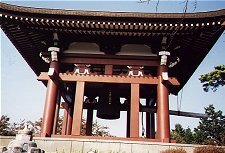 On the way, you pass several interesting sites including a gate guarded by large statues of Japanese warriors, a shrine and a large bell. 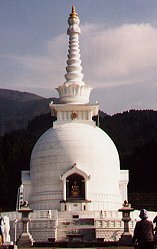 The temple itself is a tall white structure featuring four golden statues of Buddha. 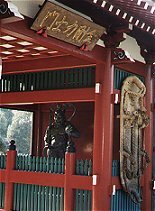 The walkway up to the temple is guarded by many statues of lions and there are shrines to various people around it. At the back there is also a war memorial. Next stop on our tour was a short boat ride on a lake. The boat itself was nothing special but the view was great. The surrounding areas were relatively untouched so we had some great mountain views. We also saw some beautiful boats out on the lake. From there we headed back up into the mountains for our last stop at some hot springs. This area reminded me of Rotorua in New Zealand. 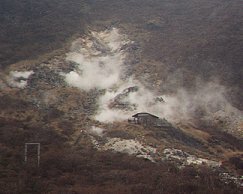 There is clearly a lot of volcanic activity in the area with steam being released in patches all over the mountain. And just like Rotorua, the smell is something you can only stand for so long. Our tour concluded with a trip back to Tokyo station on the Shinkansen. We got back to our hotel earlier than we expected so we took a short walk around to Tokyo Tower. It looked beautiful lit up in orange and yellow lights. Unfortunately though, it did not photograph too well.